The Rainy Season Has Begun! Just in time for our vow to “stay at home and do nothing all summer”, the rainy season has begun. It was sunny this morning but a storm developed just offshore at lunchtime and quickly moved inland. We enjoyed hearing the huge drops pounding on the roof. The “weather in motion” option on weather.com gave us the opportunity to show the boys, who are homeschooled, how quickly storms can erupt when the sea breeze picks up in the afternoon here. In a 15-minute span, the radar went from blue sky to a huge cell popping up on the screen. Very cool. Justin’s family was here for the weekend and they came over on Monday night so Justin could cook for all of us. He made some DELICIOUS, thick, baked fish filets with a lemon butter sauce. Soooo good! Ali made her whipped Key Lime Pie for dessert. The boys all swam after dinner and laughed so hard and loud that I’m pretty sure they could be heard across the bay. Richard hung some pretty lights outside for me so the backyard and pool after very festive now. 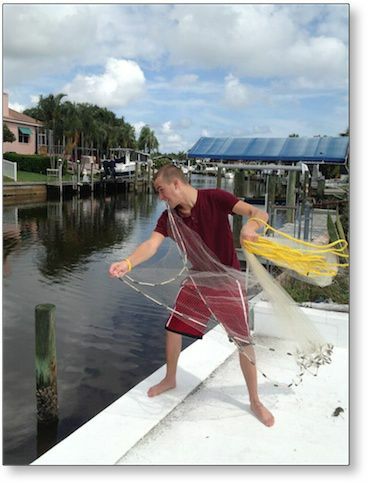 We pulled out the cast net last week and Frank and Max quickly became pros at that. We have been practicing catch and release. There are plenty of fish and a larger variety than we thought we’d find here. We’re not sure what they all are so I ordered National Audubon Society Field Guide to Fishes: North America. I can’t wait until it arrives and neither can the boys. Living on salt water is giving us an endless supply of homeschooling science lesson ideas!